Rebecca Adlington OBE is one of the greatest distance swimmers of all time. A World, European and Commonwealth Champion, Rebecca is Great Britain’s most successful ever swimmer. 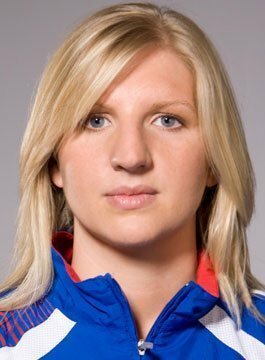 Born and educated in Mansfield, Becky Adlington started swimming with Sherwood Colliery Swimming Club. She was later selected for the Nottinghamshire County Swim Squad (Nova Centurion). In the Beijing 2008 heats of the 400 m freestyle, Rebecca broke the Commonwealth record. On 11 August 2008, she won an Olympic gold medal in the same event, beating Katie Hoff of the USA. Just under a week later, Rebecca placed herself in the record books by claiming a second Olympic gold, this time in the 800m Freestyle. Rebecca was the first woman to win swimming gold for Great Britain since Anita Lonsbrough in 1960. Furthermore, Rebecca became the first British swimmer to win more than one gold medal at a single Olympic Games since Henry Taylor won three in 1908. At the London 2012 Olympic Games, Rebecca Adlington won bronze medals in the women’s 400m and 800m freestyle events. Away from the pool, she received an OBE from the Queen at Buckingham Palace. She also won the Laureus World Sports Awards ‘Breakthrough of the Year Award’ and the SJA Sportswoman of the Year. Becky retired from elite swimming in 2013 and announced a vision for her legacy: Becky Adlington’s Swim Stars – a swimming initiative with a goal that every child in Britain will be able to swim 25 metres by the time they leave primary school. As an Olympic Gold Medallist, Becky Adlington has also undertaken roles in swimming commentary and punditry for the BBC. She formed a successful media partnership commentating from the pool at the Rio Olympics with Mark Foster and Helen Skelton.